–What Is The Difference Between A Fracture And A Stress Fracture? After participating in multiple long distance running events such as marathons you start to experience pain around the middle of your left foot. Over the past few weeks following your marathon you notice an constant dull achy pain, which has started to keep you awake at night. You are in the middle of training for an upcoming big race in a few weeks’ time and after attempting to place weight onto your foot you notice a significant amount of swelling present. After seeing your local podiatrist for an assessment, a significant amount of pain is experienced around the 2nd metatarsal. 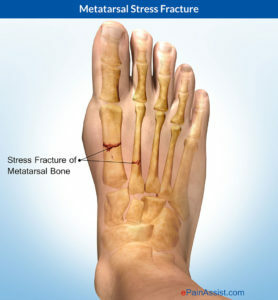 After receiving your imaging results from the recent injury you have been diagnosed with a stress fracture of your 2nd metatarsal on your left foot. More often than not the terms ‘fracture’ and ‘stress fracture’ get thrown around but we often don’t really understand the difference between them. A fracture occurs as a result of one serious injury which often results in a complete break in the bone. A stress fracture on the other hand will occur due to repeated trauma/ stress often due to overuse such as running and high impact activities. A stress fracture is an incomplete break of the bone. What causes a fracture/ stress fracture to occur? To ensure your recovery, a treatment plan has been developed to get you back on track for future races. While it is important to ensure an appropriate recovery is made, other factors such as your foot bio-mechanics and footwear need to be addressed to prevent stress fractures from reoccurring in the future.